Bogumił Gacka (1955-), founder of the biannual Personalism, Chairman of Christian Personalism, Professor of Systematic Theology at the University of Cardinal Stefan Wyszyński,Warsaw. He published Bibliography of American Personalism (Lublin 1994) and American Personalism (Lublin 1995). Now he prepares Bibliography of European Personalism and European Personalism. 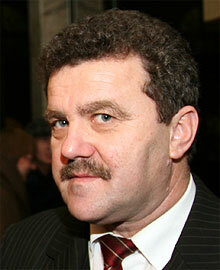 Marek Gacka (1952-), Editor of the biannual Personalism, famous antiquarian bookseller, a great specialist in books. Marek was born on October 17, 1952 in the town of Turek, Poland, and he is the eldest of the “three musketeers” of Władysław and Klara Gacka. On August 11, 1979 he married Danuta Uszyńska, they have three daughters: Karolina (1980), Gabriela (1983) and Aleksandra (1984). Marek studied Polish Philology at the Catholic University of Lublin while pursuing his studies with different universities (University of Heidelberg, Germany). He is the initiator of Personalism Association. Marek and Fr. Bogumił, his brother, presented His Holiness John Paul II with the Personalism Tribute while celebrating the Silver Jubilee of the Great Pontificate on September 12, 2003. Pavol Mačala (1958-), Ph.D., a Slovak personalist. 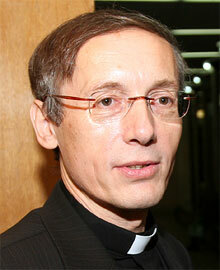 He is Chairman of History in the Department of Philosophy at the Catholic University in Ružomberok, Slovakia. A great specialist in Archeology and History of Slavs. 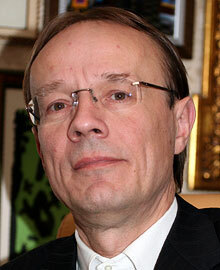 Pavol was born on February 15, 1958 in the town of Vranov near Topla River in East Slovakia. He studied Archeology at Masaryk University in Brno, SL. He worked at the Institute of Archeology, a part of the Slovak Academy of Sciences. With his wife Hana Pavol Mačala has two children – daughter Hana and son Jan. He was a counselor of the State Secretary of the Ministry of Foreign Affairs of the Republic of Slovakia and the Chief Negotiator of the Republic of Slovakia for negotiations on the accession of Slovakia to the European Union. Pavol Mačala and Member of the European Commission responsible for Education, Training, Culture and Multilingualism Ján Figel presented His Holiness John Paul II with the Personalist Tribute while celebrating the Silver Jubilee of the Great Pontificate on September 12, 2003.